Its location in the heart of Valbelluna, surrounded by the majestic peaks of the Dolomites, enchanted the Celts who called it "Belo-dunum", that means "shining hill". Today the clear light of the mountains, UNESCO's World Heritage List, is the background of a city that fascinates and surprises. Starting from the buildings that blend northern forms with Venetian Gothic, that create a unique effect, reaching the ancient fountains that characterize the Old Town. On Piazza del Duomo there are beautiful buildings of power like the Palazzo dei Rettori, the Palazzo di Giustizia, the old Vescovado, and the Palazzo Rosso. The Baroque Cathedral with its characteristic onion-shaped bell tower and the dome surmounted by the angel attributed to Andrea Brustolon also stands out., famous sculptor and distinguished "son" of this City. Walking along the streets traced by the ancient Roman decumanus we reach the baroque Church of San Pietro, casket of works by artists such as Andrea Schiavone and Sebastiano Ricci, in addition to the two famous Brustolon blades, the "Morte di San Francesco" (Death of St. Francis) and the "Crocifissione" (Crucifixion). 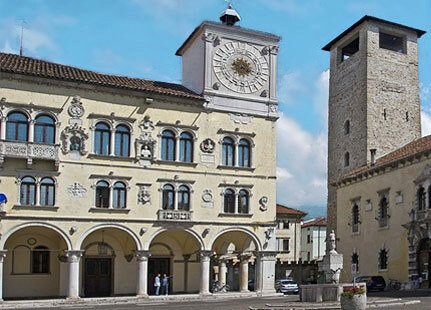 Finally, the 16th century Palazzo Crepadona is worth a visit, today the seat of numerous and prestigious exhibitions.